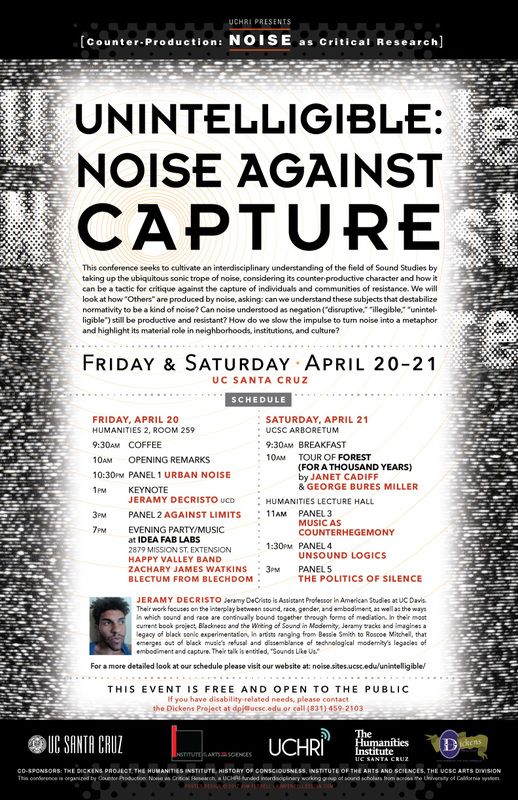 This conference seeks to cultivate an interdisciplinary understanding of the field of Sound Studies by taking up the ubiquitous sonic trope of noise, considering its counter-productive character and how it can be a tactic for critique against the capture of individuals and communities of resistance. We will look at how “Others” are produced by noise, asking: can we understand these subjects that destabilize normativity to be a kind of noise? Can noise understood as negation (“disruptive,” “illegible,” “unintelligible”) still be productive and resistant? How do we slow the impulse to turn noise into a metaphor and highlight its material role in neighborhoods, institutions, and culture? Jeramy DeCristo is Assistant Professor in American Studies at UC Davis. Their work focuses on the interplay between sound, race, gender, and embodiment, as well as the ways in which sound and race are continually bound together through forms of mediation. In their most current book project, Blackness and the Writing of Sound in Modernity, Jeramy tracks and imagines a legacy of black sonic experimentation, in artists ranging from Bessie Smith to Roscoe Mitchell, that emerges out of black music’s refusal and dissemblance of technological modernity’s legacies of embodiment and capture. Their talk is entitled, “Sounds Like Us”. + April 20th: Evening concert co-presented by Indexical at Idea Fab Labs Santa Cruz; featuring Happy Valley Band, Zachary James Watkins, and Blectum from Blechdom. This event was organized by Counter-Production: Noise As Critical Research, Gabriel Saloman Mindel and Alexander Jay Ullman P.I.s. Support has been provide by University of California Humanities Research Institute, with additional support from Humanities Institute, The Dickens Project, History of Consciousness and Institute of the Arts and Sciences, part of the Arts Division, UCSC.